Roman Catholics (53 %). Byzantine Rite Catholics (3 %). Calvinist Protestants (16 %) and Lutheran Protestants (3 %). Other Christians (1 %), mainly Eastern Orthodox and Jehovah's witnesses. Remaining 25 % consider themselves agnostics, atheists, Jews or other. Hungarians or Magyars are an ethnic group primarily associated with Hungary. The word Hungarian has also a wider meaning, because – especially in the past – it referred to all inhabitants of the Kingdom of Hungary irrespective of their ethnicity. Specifically, the Latin term natio hungarica referred to all nobles of the Kingdom of Hungary regardless of their ethnicity. There are around 9.5 million Magyars in Hungary (2001). Magyars have been the main inhabitants of the Kingdom of Hungary that existed through most of the second millennium. Following its disappearance with the Treaty of Trianon, Magyars have become minority inhabitants of Romania (official: 1,440,000; see: Hungarian minority in Romania), Slovakia (520,500), Serbia (293,000; largely in Vojvodina), Ukraine and Russia (170,000), Austria (40,583), Croatia (16,500), the Czech Republic (14,600) and Slovenia (10,000). Significant groups of people with Magyar ancestry live in various other parts of the world (e.g., 1,400,000 in the United States), but unlike the Magyars living within the former Kingdom of Hungary, only a minority of these preserves the Hungarian language and tradition. 1 Origin of the word "Hungarian"
Origin of the word "Hungarian"
The word is thought to be derived from the Bulgaro-Turkic Onogur, possibly because the Magyars were neighbors (or confederates) of the Empire of the Onogurs in the sixth century, whose leading tribal union was called the "Onogurs" (meaning "ten tribes" in Old Turkic). The H- sound in many languages (Hungarians, Hongrois, Hungarus etc.) is a later addition. It was taken over from the word "Huns," which was a similar semi-nomadic tribe living some 400 years earlier in present-day Hungary and having a similar way of life (or according to the older theories Huns were the people from which the Magyars arose). In ancient times, through the Middle Ages, and even today, the identification of Hungarians with the Huns has often occurred in history and literature, however this identification began to be disputed around the late nineteenth century, and is still a source of major controversy among scholars who insist that there could be no direct connection between the two. Hun names like Attila and Réka are still popular among Hungarians, and forms derived from Latin Hungaria are used like in the racetrack Hungaroring (mostly due to the strong English language pressure in tourism and international matters). Magyar is today simply the Hungarian word for Hungarian. In English and many other languages, however, Magyar is used instead of Hungarian in certain (mainly historical) contexts, usually to distinguish ethnic Hungarians (i.e., the Magyars) from the other nationalities living in the Hungarian kingdom. The origin of the Hungarians is partly disputed. The most widely accepted Finno-Ugric theory from the late nineteenth century is based primarily on linguistic and ethnographical arguments, while it is criticized by some as relying too much on linguistics. There are also other theories stating that the Magyars are descendants of Scythians, Huns, Turks, Avars, and/or Sumerians. These are primarily based on medieval legends–whose authenticity and scientific reliability is strongly questionable–and non-systematic linguistic similarities. Most scholars therefore dismiss these claims as mere speculation. The following section shows the Finno-Ugric theory of the origin of modern Hungarian people. For some other theories see Hungarian prehistory. Finno-Ugric is a group of related languages, which does not mean that the peoples currently speaking those languages are equally related in terms of ethnicity. The same holds true, for example, for Indo-European languages. Also, the Ugric Hungarian language is about as distantly related to Finnic languages like Finnish and Estonian as, e.g., Russian is related to Italian or Spanish. In the fourth millennium B.C.E., some of the earliest settlements of the Finno-Ugric-speaking peoples were situated east of the Ural Mountains, where they hunted and fished. From there, the Ugrians, i.e., the ancestors of the Magyars, were settled in the wood-steppe parts of western Siberia (i.e., to the east of the Urals)–from c. 2000 B.C.E. onwards at least. Their settlements were identical with the north-western part of the Andronovo Culture. Some more advanced tribes coming from the southern steppes taught them how to do agriculture, breed cattle and produce bronze objects. Around 1500 B.C.E., they started to breed horses and horse riding became one of their typical activities. Due to climatic changes in the early 1st millennium B.C.E., the Ugrian subgroup known as the Ob-Ugrians–until then living more in the north–moved to the lower Ob River, while the Ugrian subgroup that was the ancestor of the proto-Magyars remained in the south and became nomadic herdsmen. From the definitive departure of the Ob-Ugrians (around 500 B.C.E. ), the ancestors of present day Magyars can be considered a separate ethnic group – the proto-Magyars. During the following centuries, the proto-Magyars still lived in the wood-steppes and steppes southeast of the Ural Mountains, and they were immediate neighbors of and were strongly influenced by the ancient Sarmatians. In the fourth and fifth centuries C.E., the Proto-Magyars moved to the west of the Ural Mountains to the area between the southern Ural Mountains and the Volga River (Bashkiria, or Bashkortostan). In the early eighth century, a part of the proto-Magyars moved to the Don River (to a territory between the Volga, the Don and the Donets), a territory called Levedia. The descendants of those proto-Magyars who stayed in Bashkiria were seen there as late as in 1241. Indeed, many historical references related both the Magyars (Hungarians) and the Bashkirs as two branches of the same nation. However, modern Bashkirs are quite different from their original stock, largely reduced in numbers during the Mongol invasion (thirteenth century), and assimilated into Turkic peoples. The proto-Magyars around the Don River were subordinates of the Khazar khaganate. Their neighbors were the archaeological Saltov Culture, i.e., Bulgars (Proto-Bulgarians, descendants of the Onogurs) and the Alans, from whom they learned gardening, elements of cattle breeding and of agriculture. The Bulgars and Magyars shared a long-lasting relationship in Khazaria, either by alliance or rivalry. The system of two rulers (later known as kende and gyula) is also thought to be a major inheritance from the Khazars. Tradition holds that the Magyars were organized in a confederacy of tribes called the Het Magyar'. The tribes of the Hetmagyar were; Jenő, Kér, Keszi, Kürt-Gyarmat, Megyer (Magyar), Nyék, and Tarján. The Alliance was formed as a border defending ally of Khazaria mainly during the reign of Khagan Bulan and Ovadyah with the Megyar tribe holding ascendancy. Around 830, a civil war broke out in the Khazar khaganate. As a result, three Kabar tribes out of the Khazars joined the Magyars and they moved to what the Magyars call the Etelköz, i.e., the territory between the Carpathians and the Dnieper River (today's Ukraine). Around 854, the Magyars had to face a first attack by the Pechenegs. (According to other sources, the reason for the departure of the Magyars to Etelköz was the attack of the Pechenegs.) Both the Kabars and earlier the Bulgars may have taught the Magyars their Turkic languages; according to the Finno-Ugric theory, this is used to account for at least 300 Turkic words and names still in modern Hungarian. The new neighbors of the Magyars were the Vikings and the eastern Slavs. Archaeological findings suggest that the Magyars entered into intense interaction with both groups. 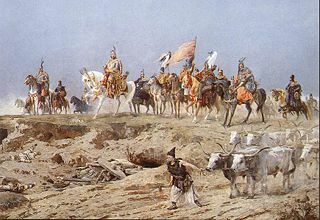 From 862 onwards, the Magyars (already referred to as the Ungri) along with their allies, the Kabars, started a series of looting raids from the Etelköz to the Carpathian Basin–mostly against the Eastern Frankish Empire (Germany) and Great Moravia, but also against the Balaton principality and Bulgaria. The entry of the Magyars into the Carpathian basin, and subsequent events. From the Chronicon Pictum, 1360. In 895/896, probably under the leadership of Árpád, a part of them crossed the Carpathians to enter the Carpathian basin. The tribe called Magyars (Megyer) was the leading tribe of the Magyar alliance that conquered the center of the basin. At the same time (c. 895), the Magyars in Etelköz were attacked by Bulgaria (due to the involvement of the Magyars in the Bulgaro-Byzantine war of 894-896), and then by their old enemies, the Pechenegs. It is uncertain whether or not those conflicts were the cause of the Magyar departure from Etelköz. In the Carpathian Basin, the Magyars initially occupied the Great Moravian territory at the upper/middle Tisza river–a scarcely populated territory, where, according to Arabian sources, Great Moravia used to send its criminals, and where the Roman Empire had settled the Iazyges centuries earlier. From there, they intensified their looting raids all over continental Europe. In 900, they moved from the upper Tisza river to Transdanubia (Pannonia), which later became the core of the arising Hungarian state. Their allies, the Kabars, probably led by Kursan, probably settled in the region around Bihar. Upon entering the Carpathian basin, the Magyars found a mainly Slavic population there. Remnants of the Avars lived in the southwest and Romanians in the east and southeast, although the latter is a matter of controversy (see Origin of Romanians). After the battle of Augsburg (956), the Magyars gradually changed their pastoral way of life to an agricultural one and borrowed hundreds of agricultural Slavic words. See History of Hungary for a continuation, and Hungary before the Magyars for the background. Many of the Magyars, however, remained to the north of the Carpathians after 895/896, as archaeological findings in Polish Przemysl suggest. They seem to have joined the other Magyars in 900. There is also a consistent Hungarian population in Transylvania that is historically not related to the Magyars led by Árpád: the Székelys, the main ethnic component of the Hungarian minority in Romania. They are fully acknowledged as Magyars. The Székely people's origin, and in particular the time of their settlement in Transylvania, is a matter of historical controversy (see Székely for details). The Magyar leader Árpád is believed to have led the Hungarians into the Carpathian Basin in 896. Magyar expansion was checked at the Battle of Lechfeld in 955. Hungarian settlement in the area became approved by the Pope by the crowning of Stephen I the Saint (Szent István) in 1001 when the leaders accepted Christianity. The century between the Magyars' arrival from the eastern European plains and the consolidation of the Kingdom of Hungary in 1001 was dominated by pillaging campaigns across Europe, from Dania (Denmark) to the Iberian peninsula (Spain). At the Hungarian conquest, the Hungarian nation numbered between 25,000  and 1,000,000 people. (Hungarian historians give the lowest estimates as 70,000 people, Serbian and Slovak authors suggest much lower numbers - around 25,000.) The Slavic population of the region (and remnants of the Avars in the southwest) was also nearly fully assimilated by the Magyars, except those living in present-day Croatia and Slovakia. Croatia joined the Kingdom in 1102. The first accurate measurements of the population of the Kingdom of Hungary including ethnic composition were carried out in 1850-1851. There is a debate among Magyar and non-Magyar (especially Slovak and Romanian) historians about the possible changes in the ethnic structure throughout history. Some historians support the theory that the Magyars' percentage in the Carpathian Basin was at an almost constant 80 percent during the Middle Ages, and began to decrease only at the time of the Ottoman conquest, reaching as low as around 39 percent (or 29 percent according to historians from outside Hungary) in the end of the eighteenth century. The decline of the Magyars was due to the constant wars, [[famine[[s and plagues during the 150 years of Ottoman rule. The main zones of war were the territories inhabited by the Magyars, so the death toll among them was much higher than among other nationalities. In the eighteenth century their percentage declined further because of the influx of new settlers from Germany, Serbia, and other countries. Some Slovak and Romanian historians tend to emphasize the multi-ethnic nature of the Kingdom even in the Middle Ages and argue that the drastic change in the ethnic structure hypothesized by Hungarian historians in fact did not occur. Therefore, the Magyars are supposed to have accounted only for about 30-40 percent of the Kingdom's population since its establishment. In particular, there is a fierce debate among Magyar and Romanian historians about the ethnic composition of Transylvania through the times; see Origin of Romanians. In the nineteenth century, the percentage of Magyars in the Kingdom of Hungary rose gradually, reaching over 50 percent by 1900. Spontaneous assimilation was an important factor, especially between the German and Jewish minorities and the citizens of the bigger towns. On the other hand, about 1.5 million people (of whom about two-thirds were non-Hungarian) left the Kingdom of Hungary between 1890-1910 to escape from poverty. The years 1918 - 1920 were a turning point in the Magyars' history. The Treaty of Trianon, which concluded World War I, was signed by the Allies on one side, and Hungary—as a successor of Austria-Hungary—on the other. As a result, the "Kingdom of Hungary" was cut into several parts, leaving only one quarter of its original size, and about one third of the Magyars became minorities in the neighboring countries. Census information from the years 1910 and 1920 reveal confusing results: the questions asked Hungarians about their language, rather than their ethnicity. The results are subject to controversy to the present day regarding the percentages of ethnic "Magyars" that reside in the various geopolitical jurisdictions. In the twentieth century the Magyar population of Hungary grew from 7.1 million (1920) to around 10.4 million (1980), in spite of the big human loss in the Second World War and the wave of emigration after the failed Revolution in 1956. The number of Hungarians in the neighboring countries mostly stagnated or slightly decreased, because of assimilation (in part forced – see Slovakization and Romanianization), emigration to Hungary (in the 1990s, especially from Transylvania and Vojvodina), and natural decrease. After the "baby boom" of the 1960s a serious demographic crisis began to develop in Hungary, parallel to the neighboring countries. The Magyars reached their highest point in 1980 and after that they began to sink. The Magyar population of Hungary and neighboring countries is expected to further decrease to 7-8 million by 2050. The Magyars represent today only around 35 percent of the population of the Carpathian Basin. Their number is appr. 12-13 million in 2006, almost the same as in 1910. While other ethnic groups increased their numbers 2 or 3 times (or even more) during the twentieth century, the Magyar population stagnated. The increase of population in Hungary was the third slowest in the world after Bulgaria and Saint Kitts & Nevis between 1950 and 2000–only 8.6 percent (from 9,338,000 to 10,137,000). Besides the various peoples mentioned above, who mixed with the Magyars during their long way to and at their arrival in Hungary, the Magyars also include an input from other peoples settled in this territory after the arrival of the Magyars, for example the Cumanians, Pechenegs, Jazones, Germans and other Western-European settlers in the Middle Ages. Romanians and Slovaks have lived together and blended with Magyars since early medieval times. 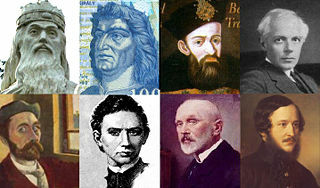 Turks who occupied the central part of present-day Hungary from c. 1541 to c. 1699 and especially the various nations (Germans, Slovaks, Serbs, Croats and others), that settled depopulated territories after the departure of the Turks in the eighteenth century all added their important contribution in composing the modern Hungarian nation. The advanced economic and political conditions of the Slavs, who had been settling in the entire area, exerted a significant influence over the newly-arrived Magyars after 896; in fact, several Hungarian words relating to agriculture, politics, religion and handicrafts, were borrowed from Slavic languages. Both Jewish and Roma (Gypsy) minorities have been living in Hungary since the Middle Ages. ↑ In contexts where it is necessary to disambiguate between ethnic Hungarians and inhabitants of the Kingdom of Hungary, ethnic Hungarians are referred to as Magyars. ↑ Milan Tutorov, Banatska rapsodija, istorika Zrenjanina i Banata. (Novi Sad, 2001). This page was last modified on 7 August 2018, at 18:35.